It’s no secret women in tech are few and far between. In addition to this, confidence and a clear vision for one’s career path is also not a common occurrence for many New Professionals entering the workforce. After graduating from the University of Cape Town in 2013 as an Electro-Mechanical Engineer, Shaye Pearson knew pursuing a job in a typical engineering firm was not for her. 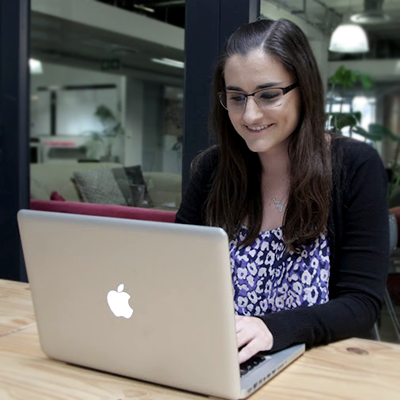 After taking some time off to travel overseas, Shaye returned to Cape Town and started working at an analytics consulting company as a Junior Data Analyst. She quickly worked her way up to an Analyst position before becoming a Senior Analyst overseeing a small team. Shaye was then approached by GetSmarter to join the learning analytics team where she holds her current position as a Data Analyst in Data Infrastructure. Shaye has been with GetSmarter for over a year now. Her day is predominantly comprised of working with different data analysis programmes to draw insights from the data – assisting the business with their decision-making processes. Gender affects the way women are perceived and treated in a multitude of different industries and roles, and this is particularly pervasive in the tech industry. However, attitudes are beginning to change and stereotypes have started to fall away. There’s still a long way to go in ensuring women are treated equally within the workplace, but Shaye feels she’s been extremely fortunate. She describes how her upbringing and the positions she has held thus far have been filled with support and encouragement. However, Shaye shares the same sentiments of other women. 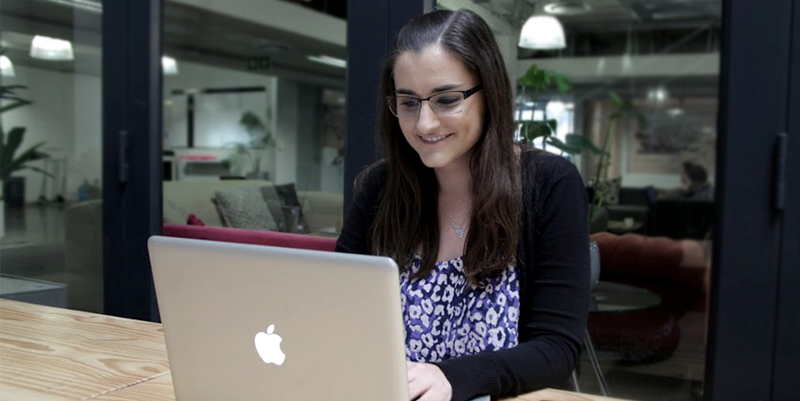 “Starting off my career in engineering, I definitely felt the gender gap a lot more. Women continuously feel like they need to prove themselves and prove they also belong in what is conceived to be a male-dominated faculty or workplace.” Shaye believes this pushed her to always do better, saying the best part of being a woman in the tech industry is the opportunities it affords you to stand out from the crowd. The lack of women in the technology industry may be attributed to too few female role models and mentors within the field. Shaye discusses how she felt like an outsider whenever she spoke to people about her career-choices, which in turn led her to question herself. Having been one in about three women out of 30-40 students in her class at university accentuated the idea that “it’s seen as abnormal to be a woman going in tech.” Her advice to women wanting to enter the tech industry is to remain confident and to never let anyone make you feel like you don’t deserve to be where you are. She notes the importance of finding a working environment where you’re valued for who you are and the work you do. Shaye encourages aspiring women to find a mentor, and to look for a position with opportunities to share your knowledge and learn from your peers. For male-counterparts within the industry, Shaye encourages men to support women wanting to pursue careers within tech. Mentors don’t have to be gender-specific and having someone assist with building confidence and helping women feel like they belong, will play a big role in bridging the gap. An interesting correlation can be made between women as disruptive innovators within previously male-dominated industries, and rapid technological advancement. In general, humans are not incredibly forthcoming when it comes to accepting and dealing with change. 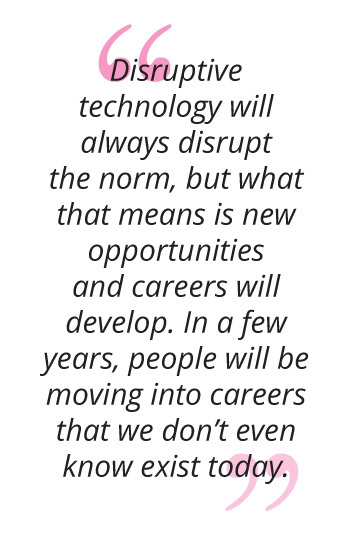 The phrase “disruptive technology” tends to instill a sense of worry and fear into many. However, this need not be the case. Shaye recommends viewing disruptive technology as an opportunity for growth, and to find gaps in the workplace to strike when the time is right. It’s important to keep up to date with current trends and to remain ahead of the curve wherever possible. A continuous-learning mindset, seeking to upskill, and building strategic partnerships all strive towards ensuring you work with disruption and not against it. Inspired to take the next step to stand out in your industry?